Right up front I should say this: I’m a huge Car Wars fan. When I was a young lad, I absolutely enjoyed reading Uncle Albert’s catalogs (he of the Gas Stop and Gunnery Shop! ), the AADA road atlases, and endlessly building different cars, trucks, tanks, and helicopters. Unfortunately, I didn’t get to play too many games—only a relative handful. I read the excellent novels for the genre (Double Jeopardy by Aaron Allston and Square Deal by David Drake are both well worth reading), and I even collected the comic books! Having said all that, I’ve often thought about changing Car Wars—about how I… if I were King for a Day… would choose to do something different. Uncle Albert would be so proud! I’ve always felt that, at its heart, Car Wars was founded upon Mad Max and (especially) the Road Warrior. 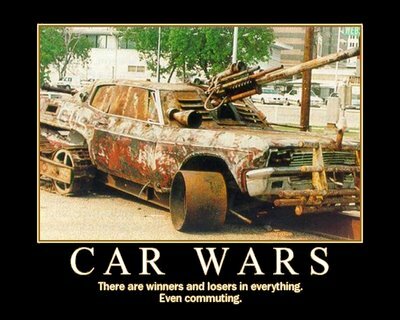 However, taking a closer look at the world of Car Wars reveals some very significant differences. For one, the future of Car Wars is awfully clean, especially for the bombed-out wreckage of a post-nuclear war. 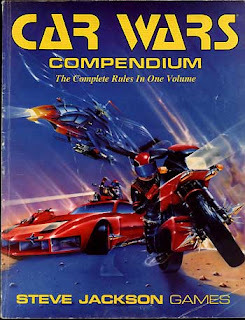 Cars run on electric power plants, cloning, lasers, and targeting computers are all accepted and fairly regularly-encountered technology, and while there may exist tribes of militant mutant motorcyclists out in the wastes, most of the action takes place in relatively up-scale and flashy autoduelling arenas, complete with sponsors, ad blimps, and holographic cameras recording everything. Naturally, my first instinct would be to tweak some of these facts. #1. Gas burners, baby! 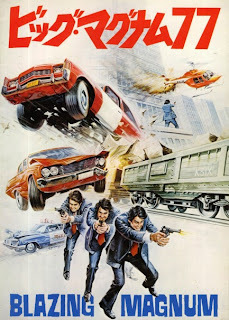 I’d do away with the notion that Car Wars is a setting built on the electric car. Everything runs on “the precious juice,” which means everything can (and should) blow up. Spectacularly. Obviously this means that fuel would definitely be a valuable resource… and an excellent plot point for any missions that take place outside of the arena. You could even emphasize it inside the arena with special caches for refueling or make targeting an opponent’s pit crew a valid (and fan-favorite) tactic. This is so true. Especially around the DC Beltway. #3. Technology exists, but is hella rare. I have nothing against cloning, lasers, and targeting computers, per se, but I’d like to make sure and establish that this stuff is like uncut diamonds—extremely rare and extremely valuable. In fact, most autoduellists who aren’t in the top circuit would probably have vehicles closer to the Road Warrior standard. I’ve heard of a concept called “Chassis & Crossbow” that seems to grab that idea really well—where Mad Max Rockatansky is killing most of his enemies with a sawed-off shotgun and the heavy, scoped revolver of the Humungous is obviously a precious relic rather than just a standard sidearm. Naturally, this would be lessened for the really good circuits of autoduellists—that’s where the money is, and generally I think it would be just fine for fights at that level to involve a lot more “James Bond” tech and gadgets. ‘Cuz, to be honest, that is also a lot of fun. #4. More dynamic combat. Car Wars is a good rules system for what it is, but one thing I think it lacks is a certain level of style. Ideally, I’d like to imagine an autoduel with lots of cool, tricky maneuvers, and the drivers are definitely concerned when they get hit… after all, they’re not driving around tanks! In the Car Wars rules, it’s fairly easy to build a giant brick of armor with a few guns and drive around in circles in a drawn-out war of attrition. I’d like to move beyond that—perhaps the heaviest armor can only stand up to say three or four good hits, with the average car only able to weather one or two before exploding in a greasy fireball. The second part is combat is a bit deadlier with armor being reduced in value—autoduels would be more about maneuvering and getting a solid hit, whereas taking more than a few slugs from an enemy turret is likely to end in a sedan flipping through the air, on fire. #5. Blood Sport! In my opinion, another undeniable influence on Car Wars is Death Race 2000, the movie where you get points for running over pedestrians and collateral damage is not just accepted… it’s expected! This goes hand-in-hand with #1 and #4 in helping to make the feel of the game shift slightly. I think it would be cool, for example, if you got some advantage… possibly “points” or just a morale or fame shift, for example, for doing bloody things during the autoduel. Firing into the stands, intentionally driving over pedestrians, etc. Obviously this is pushing some limits here both of taste and gore, but I feel it is definitely appropriate to the genre. Hell, yes. Now, time to put some guns on those cars and we’re in business. I knew I liked you for a reason. Heh. First Robotech and now Car Wars! I’m huge fans of both and more. Interesting take, although the geek in me forces me to point out that the original Mad Max movie was not set in a post-apocalypse setting. There were obvious signs of civilization (e.g., the police force Max was a part of, the hospital his wife and child were sent to after the attack). So the base setting for Car Wars is viable; enclosed city-states maintaining the status quo with lawless wilderness outside. Looking at the current oil situation, I think the game’s assumption of electric-powered cars is prescient. Given all the changes you’d make, it would be better to write an entirely new game.